On time and on the dime. It’s how our clients describe us, a simple explanation for a simple philosophy. At LIFESTYLE KITCHENS & BATHS, we believe that planning is the most important part of the project and you are the most important part of the planning. 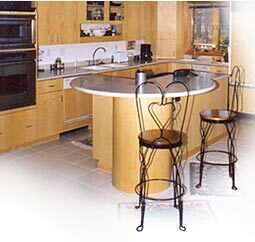 By listening to you and getting to know your needs, we are able to provide a functional kitchen designed around your needs, your lifestyle, and your budget. The Lifestyle Kitchens & Baths studio is designed to provide a relaxed atmosphere for you to work out the details and selections of your project with the assistance of a Certified Kitchen and Bath Designer. By committing to an exclusive Wood-Mode showroom featuring Traditional, Contemporary, and Old World displays, we are able to offer you an excellent value with competitive pricing and exceptional service. The owner of Lifestyle Kitchen & Bath, Larry G. Routen, CKD/CBD, has been a successful designer in the kitchen and bath industry since 1967, a multiple winner in the National Kitchen and Bath Design competition, and has been selected as one of the top ten professionals in the industry. He has always promoted professionalism throughout his career and is one of only two people that have the distinction of serving as president of the National Kitchen & Bath Association (NKBA) and as chairman of the board of governors for the Society of Certified Kitchen and Bath Designers. Larry’s trademarks have always been creative problem solving and attention to detail. He is committed to providing the best possible design, products, and service to meet his individual client’s needs, budget, and lifestyle. Do you want more information about custom designs for your lifestyle? Please contact us !